2015 Sun Tracker PARTY BARGE 24 Signature Series This is my personal boat hand selected from the Disney fleet, fresh water use only, this was the nicest one of the 2015 class and I paired it with a Mercury 150 HP 2 stroke V-6 engine with an SS Prop that pushes this toon over 35 MPH !!! Vinyl floor , bimini top, security box, stereo, GPS /depth/fish finder, privacy station with porti-potti, rear boarding ladder, 32 gallon fuel tank, full gauges, rod rack, tons of storage, built in waste basket, portable cup holders, brand new heavy duty galvanized trailer with spare tire/rack, dual batteries with switch. I made this boat for me and my family , now we are wanting a cruiser. Turn key and ready to go, You will like it! 2007 Sun Tracker PARTY BARGE 24 Signature Series Fishing families who love to party will find a great fit in the 24 foot 7 inch SUN TRACKER PARTY BARGE 24. A comfortable fit for a party of 12, it sets the bar on roomy comfort—its 97 inch deck width delivers more usable space than any boat in its class. Plush lounge seating, loads of underseat storage, removable table, pop-up changing room, entertainment center with freshwater sink, 36-quart cooler, padded aft sundeck, Sirius-capable AM/FM/CD with MP3 jack and stylish Bimini top round out on-board comforts. Dual bow-mounted swivel fishing chairs offer angling flexibility at any time. 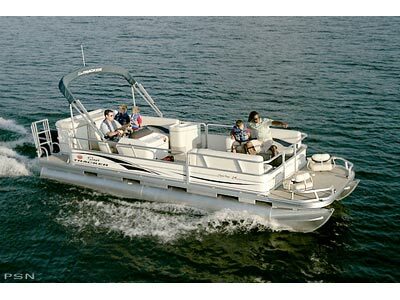 Oversized 24 inch multichambered pontoons and maximum 115 horsepower deliver performance and value. 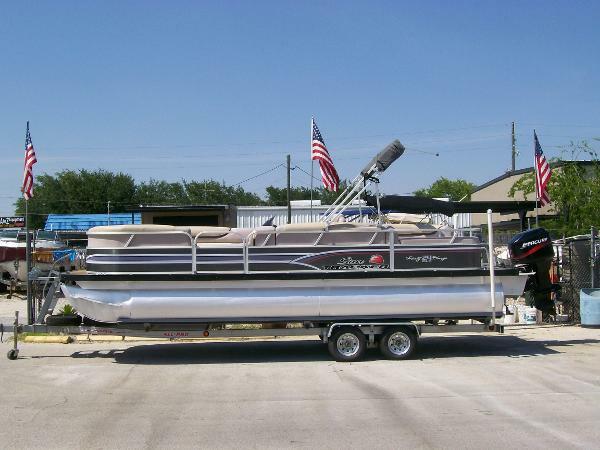 - 2007 Suntracker 24 Party Barge Signature Series powered by Mercury F 60 with trailer.